Featuring a pleated bodice and skirt, a sweetheart neckline, and spaghetti straps, this satin junior’s dress is accented perfectly with a coordinating belt. An embroidered lace sweetheart bodice adds just the right amount of sophisticated shine to this junior’s dress. A cocktail-length chiffon skirt is accented with matching spaghetti straps and a ruched waistband. An embroidered lace sweetheart bodice adds just the right amount of sophisticated shine to this junior’s dress. A floor-length chiffon skirt is accented with matching spaghetti straps and a ruched waistband. 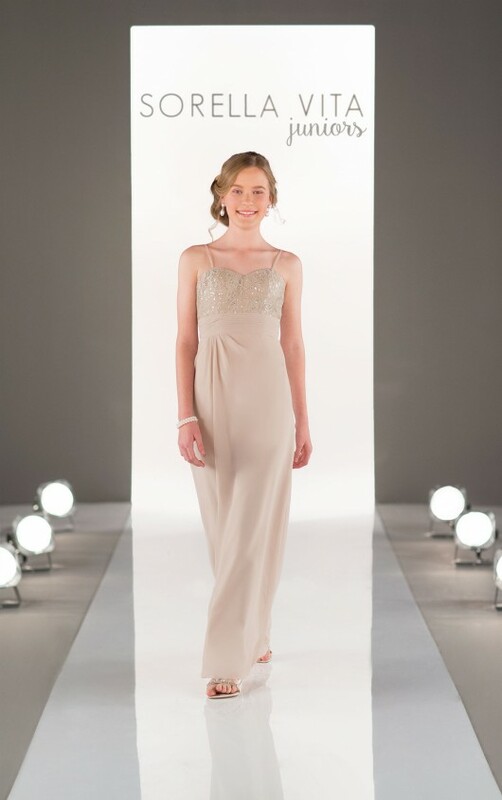 The sweetheart neckline – and matching spaghetti straps – of this junior’s dress flows perfectly into a cocktail-length chiffon skirt. 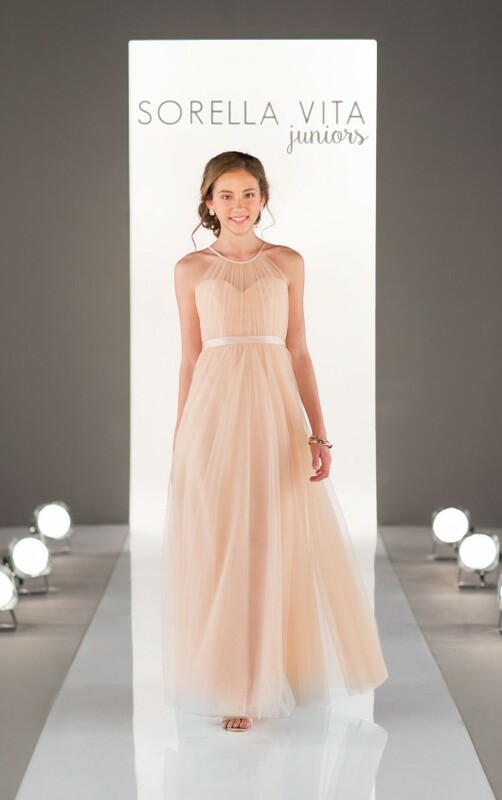 The sweetheart neckline – and matching spaghetti straps – of this junior’s dress flows perfectly into a floor-length chiffon skirt. Both sweet and elegant, the sweetheart neckline of the bodice is highlighted by an illusion-tulle halter neckline. The floor-length tulle skirt is perfectly complemented with a coordinating belt. Featuring two streamers on the front and two on the back of the dress - drape, twist or wrap the streamers to create more than 18 different looks. With endless possibilities, Maid Your Way is the perfect way to mix up looks to enhance each junior bridesmaid’s unique style. Featuring two streamers on the front and two on the back of the dress – drape, twist or wrap the streamers to create more than 18 different looks. With endless possibilities, Maid Your Way is the perfect way to mix up looks to enhance each junior bridesmaid’s unique style. 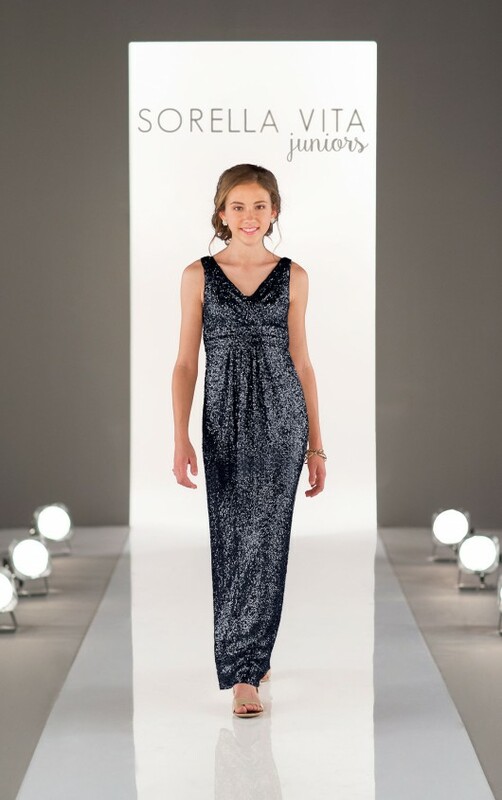 Add a little sparkle to your junior’s style with this cocktail-length sequin dress. Its cross-front V neck is perfectly accented with a matching waistband. 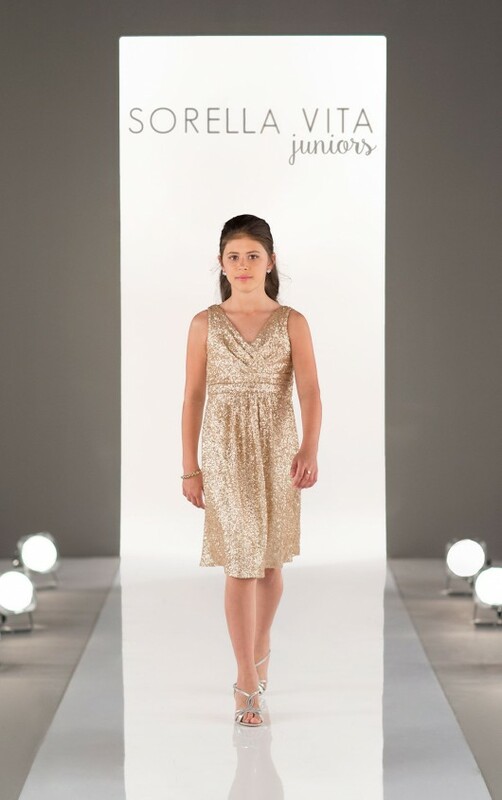 Add a little sparkle to your junior’s style with this floor-length sequin dress. Its cross-front V neck is perfectly accented with a matching waistband.